It was a cool crisp morning during #WinterInRome and our group was heading out to see Street Art in Rome with PersonalizedItaly. 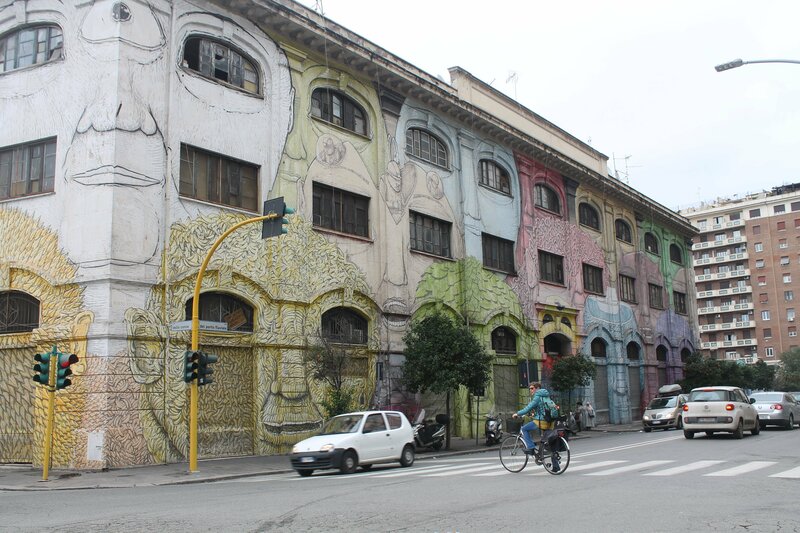 Our first stop for Street Art in Rome tour was the neighborhood of Ostiense. The tour started with this 25th Anniversary Special Mural outside Cartoon Network’s office. I thought it was striking and super cute since cartoons capture expressions in the best way. Then came the Wall of Fame…. Another eye catching Street Art in Rome was this building below done by the artist BLU. It is on Ostiense’s Via del Porto Fluviale and is the most prominent street art I have ever seen! Next stop for Street Art in Rome tour was the neighborhood of Pigneto where Italian Director and artist Pier Paolo Pasolini rules! He was in love with the neighborhood and artists have made sure to capture the visionary all along Via Fanfulla da Lodi. For instance, Pasolini’s face is behind this superhero and symbolizes a very famous article Pasoli once wrote for a newspaper. 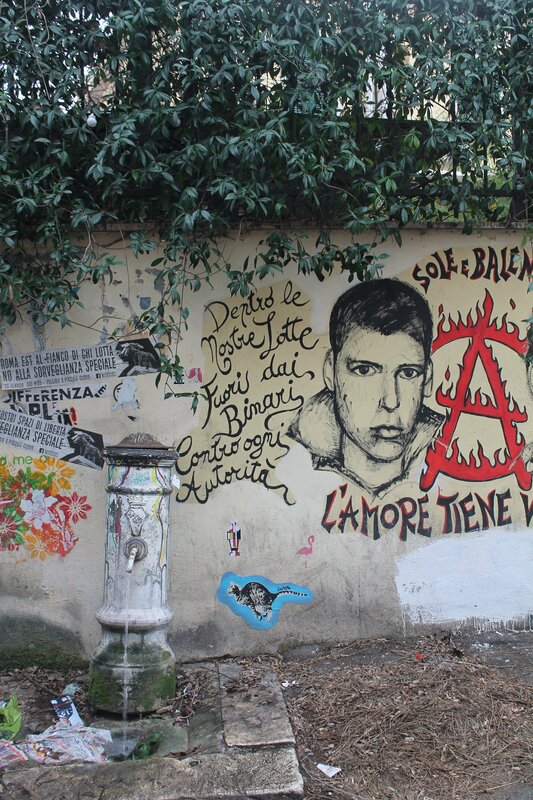 The title of the article was “Io so i nomi” (I know the names) and hence on the mural as well. 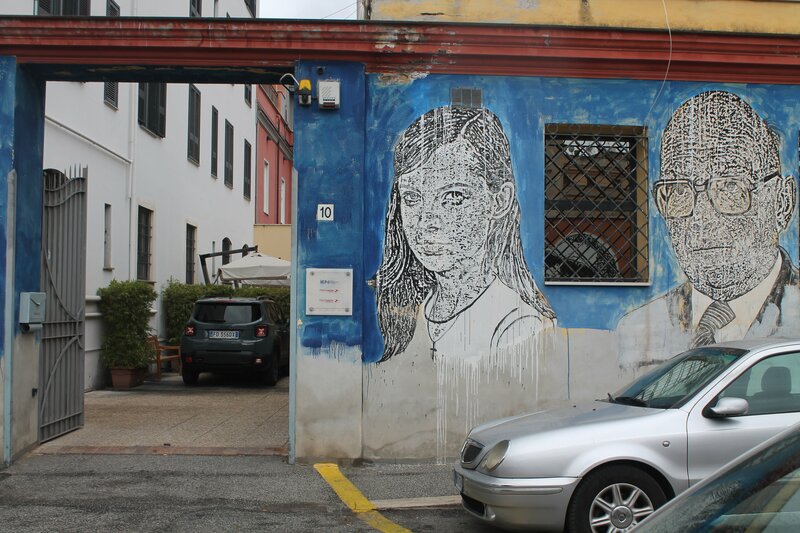 This famous face below, of the actress Margherita Caruso, is another popular Street Art in Rome. She played the young Virgin Mary in Pier Pasolini’s film “Il vangelo secondo Matteo” (The gospel according to Matthew). All in all, it was very interesting to see Rome’s Street Art, definitely a fad and a great way to get off the tourist track. Special thanks to PersonalizedItaly and Linda from The Beehive who got this planned for our group. What about you…. Do you like street art?? Do you enjoy this new “movement” of beautifying abandoned buildings and spaces to better a neighborhood?? Yes, yes, I do love it, and I have already acquired maps and addresses to do a proper tour of Rome’s street art one day. For now I have only seen some of that in Ostiense. Did you go to some other districts as well and you are saving it for another post? 🙂 I was there but didn’t know to look for either the Cartoon Network or the Wall of Fame. Next time. 🙂 I saw the portraits of Keats and Shelley near the Non-Catholic Cemetery though. 🙂 When are you planning to visit?? It would be so cool to read your take on this. I haven’t seen the others but I have saved them for next time 😉 There were a few in Testaccio that I saw last year. I love it! These are some beautiful pieces. Street Art is very well known and has become a global phenomenon in a few years. From the canvas, this new generation of urban artists has passed to the walls and I do not mean the usual frescoes, so a step forward but also backwards. It is a new form of visual expressiveness but above all artistic and also communicative. 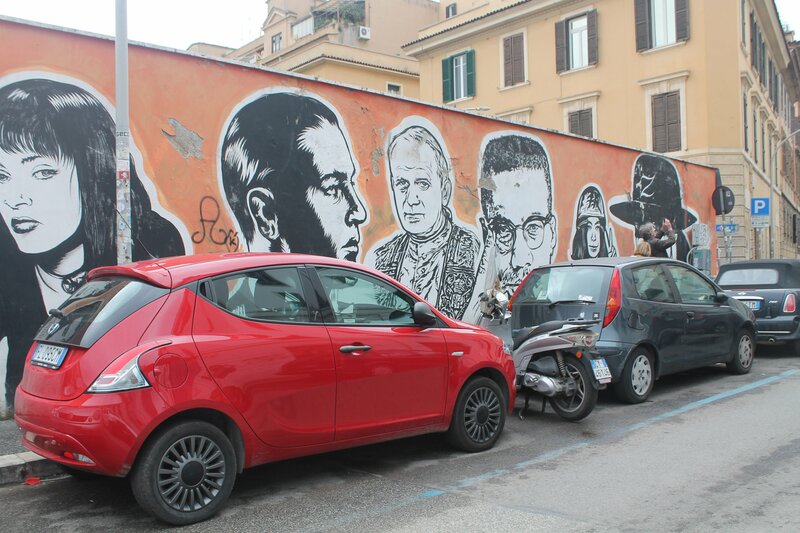 There are many neighborhoods in Rome where you can admire the Street Art. 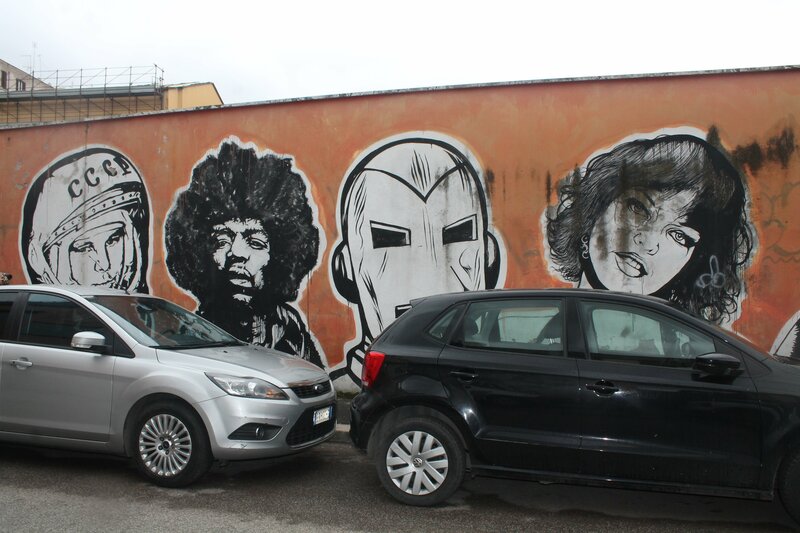 However, Ostiense is the most emblematic place and there have not yet been episodes like in New York where they repainted the buildings of a neighborhood famous for its Street Art. I am glad that you could see this “different” Rome. Amazing artwork. I bet there is more of this since I visited Rome in 2003…. I love this post, Ishita! Roman street art is is special and a nice diversion from the typical tourist attractions. Well done! Good idea for a post, because sometimes old buildings can get, well, old. As to your question, I do like street art and I just want to say that there’s such a difference between street art and tagging, which I hate, and people too often try to blur that line in their interpretation of said vandalism. I was referring to the type of graffiti that you see all over cities that was started by gangs where they “initial” their turf with their characteristic sign. You know, when I read your response, I realized that the word “tagging” is probably used more now on social media than in this urban context. Hahaa yes .. You got it! That is why I was wondering but I understood your point. Thanks for explaining back. That’s strange. You’re the second person to tell me that. I’m sorry about that. I honestly don’t know how everything seems to work most of the time (tocca ferro). And I know that there will come the day when I need computer help on my website – actually, the day has come and gone, but I keep putting it off… Thanks for hanging in there! I think its happening to me too. Someone I know recently followed me again and he hadn’t unfollowed me and we were surprised too!Don’t worry I understand. And yes get your computer work fixed! I love street art. It makes a statement and is inclusive. Great post. That art is really impressive and best of all, it is free to see and gets you to other parts of the city! I love it! I adore street art! The Wall of Fame is amazing! There is some interesting street art here in Cosenza but not on this level. There is a seaside town called Diamante which is known as the city of murales, it’s quite interesting! Thank you for a more offbeat look into what Rome has to offer. Great images. We are going to be passing through Rome in a few weeks time so I shall have to play I Spy and see if I can track any of these down! I hope you can 🙂 Just visit this neighborhood and walk around. There is so much! Love seeing how different countries go about street art. I’m based in Bristol and we have a bear statue (in the Bearpit) that’s the spitting image of your picture! 🙂 So cool to know!